Previous PostMaori Carving in Auckland MuseumNext PostRain! You may need to search out McDonalds McCafe’s for your late coffee fix. At least we find their coffee consistent whereas you often don’t know what sort of coffee you will get when you go to different cafe’s. Yes, McDonald’s coffee isn’t bad is it – just not quite the same as a cosy NZ cafe though! 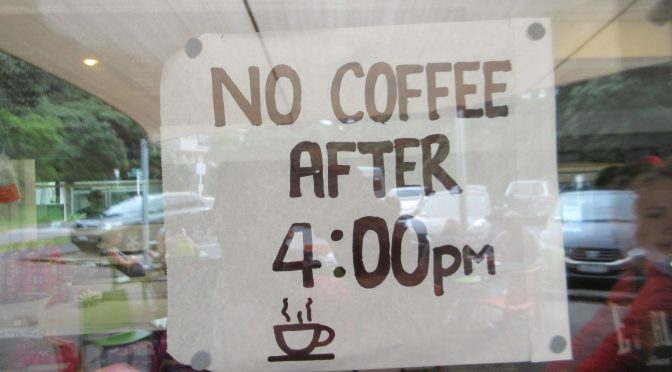 Yes it sometimes annoys me that the coffee places close at 4:00pm. We are spoilt for choice so if I walk into a coffee place and they don’t have a newspaper (Press..Our local) I walk out unless I’ve got other reading to do. Yes, newspapers are a definite plus.